When The Elstree Project launched in September 2010, I had no idea I would be sitting on stage three years later listening to Brian Blessed doing an impersonation of the Queen. However, that’s exactly where I found myself following the opening screening of the third Elstree Film Season. 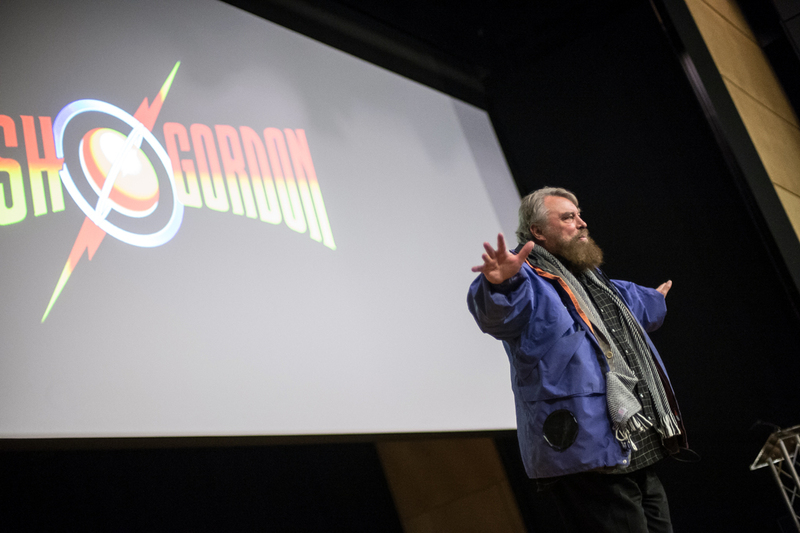 Brian was in attendance at the Weston Auditorium, at the University of Hertfordshire’s de Havilland campus, to talk to the audience about his role in the making of Flash Gordon, in which he played the memorable character Prince Vultan - complete with a gold Viking-style helmet and giant bird wings. The film was partly filmed at the nearby Elstree Studios, which was also home to Star Wars and The Shining at the time of production. Conducting research into the history of classic productions, such as Flash Gordon, is always rewarding because you never know quite what information you are going to find. Oral history interviews are a wonderful way to connect with the past, and each interview is unique because it is a personal memory being shared. This summer I interviewed Brian on behalf of The Elstree Project, in the preview theatre of the studios, and he told me about how the Hawk Men were winched up into the roof of the soundstage against a blue backdrop in order to achieve the flying sequences. Many crew members would feel ill from the heat of the studio lights or from having just eaten lunch, and toilet breaks involved having to winch everyone back down again. The process apparently took ages! One of the most interesting stories Brian told me was about how - after being an actor for the BBC - working for “the other side” (ITV) was always seen as disloyal and frowned upon. When Brian first started to make guest appearances in The Avengers and Randall and Hopkirk (Deceased) at Elstree, he was told off and felt guilty. However, he enjoyed the freedom and soon came to regard Elstree as a hugely enjoyable place to work; he would even cycle to the studios if the car to collect him didn’t arrive. The video of Brian talking to The Elstree Project can be found online here. Brian was a fascinating interviewee, and the added bonus of having him launch our third Elstree Film Season was a wonderful treat for our audience. Next week we get to screen an episode of Randall and Hopkirk (Deceased) and I have the joy of sharing a new interview we have recorded with Kenneth Cope before the screening.